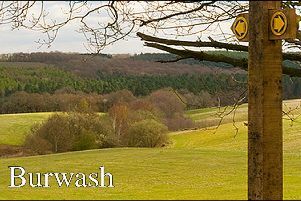 LOVE BURWASH: Tomorrow, Saturday, morning the volunteers will be out and about giving our three villages a spring clean. They will wash the road signs, clear over grown vegetation, pick up litter and generally spruce the area up. You can join in by contacting the Parish clerk, on Burwashparishclerk@gmail.com or on 07854 699518. Of course we can all do out bit to keep the villages looking good by not dropping litter and picking up after your dog. SOUP LUNCH: Thank you to everyone who supported the last soup lunch. Once again it was a fun event with a great atmosphere. We had even more people come along to taste one or more of the seven delicious freshly made soups and the naughty but nice desserts. Some went back for more than seconds which was good and we had very little left at the end of the day. Grateful thanks to everyone who came along and especially the amazing helpers. We raise £474 for the new window funds at the village hall. RACE NIGHT: The football club invite you to join them tomorrow, Saturday, evening at 7.30pm for really fun evening at the The Bear Motel, where thy will be hosting a race evening. These are such great event, with a little gambling and lots of laughs, watching the televised races to see who wins. The proceeds from the event will be split between the Football Club and Family Spirit charity in Uganda. Promises to be a fabulous evening. Walk:The next walk for strollers will take place on Wednesday morning. These monthly walks are lead by Ijon Jenner and enjoyed by those who join him. They meet at the Bear car park at 9.00am, before walking round the beautiful villages and the public footpaths. If you would like to join them they would be pleased to have you especially if you are new to the area. It is a great way to meet new people, find your way around the countryside and learner about the place you live. Call Jon on 01435 882045 if you want to know more. The walks end in time for lunch. KIPLING: Last Friday morning a good crowd of villagers gathered to witness the unveiling of a beautiful bronze figure of Author and Burwash resident, the late Rudyard Kipling. Although he lived here in the early 1900’s Kipling is today still a big part of our village. His home at Bateman’s is open to the public every day with lots of different events held there too. This beautiful bronze statue is the work of talented Burwash resident Victoria Atkinson. It was commissioned by the Burwash Parish council and is certainly an amazing piece of work. It is situated in the middle of the high street, beside the new flats. Well done Victoria on doing such a wonderful statue and thank you to the Parish council. This is certainly something for Burwash to be proud of. PANTO: The first three performances of Peter Pan presented by the Burwash Amateur Pantomime Society have been a resounding success. That is the feeling I am getting from the amazing comments from those who were lucky enough to be in the audience. Comments like I haven’t laughed so much in a long time, the fluffs were professionally covered by the talented cast. There was a lot of audience participation from adults and children alike. One comment from a long standing member of the village who has seen most of these pantos over the years was its the best ever. There are three more performances this weekend, tonight, Friday, at 8pm and tomorrow, Saturday, at 2.30pm and 7.30pm. You may be lucky enough to get tickets, call in at the Internet cafe in the car park this morning from 10am to 1pm or try the ticket line at www.ticketsource/baps. Pantomime: Time has run out for final rehearsals, scenery painting and making props and costumes as the first performances of The Burwash Amateur Pantomime society’s rendition of Peter Pan take place tomorrow. The afternoon session has sold out but there are still tickets available for the evening which starts at 7.30pm. There are a few still available for Sunday afternoon too. This one starts at 2.30pm. Tickets are available at the Internet cafe this morning or via www.ticketsource/baps. There are three further performances next weekend on Friday evening 8pm , Saturday afternoon 2.30 & 7.30pm. We wish everyone involved the best of luck for three great performances. WALK: The next walk for strollers will take place on Wednesday morning, leaving the Beat car park at 9am. These walk are for those who prefer a gentle walk rather than a brisk ramble. They take in some of the network of public footpaths that cross the beautiful countryside around our three villages. Iron Jenner will lead the way and he would be happy to see you there. If you are new to the area this is a great way to make new friends and learn your way round. The walks end back at the car park at lunch time. Call Jon on 01435 882045 for more details. DATES: Like most January’s, this one has proved a quiet one with regards to things going on in the village. Clubs and societies have resumed their normal club days and are preparing events for the coming months. Here are a few for your diaries. The pantomime is being held on February 9, 10, 15 and 16. Performances on Saturday are at 2.30pm and 7.30pm, Friday 8pm and Sunday 2.30pm. Tickets available from The Internet cafe on Monday, Wednesday and Friday morning from 10am to 1pm or via www.ticketsourcs.co.uk/baps. This year they are performing Peter Pan. CHRISTMAS DAY LUNCH: I think this has to to be the best one yet. What a wonderful day we had. The new volunteers were amazing, everything was done so quick and they were warm and welcoming to the thirty diners who joined us. We were delighted to welcome some new faces this year who would otherwise have spent the whole day alone, instead they had someone new to chat with, enjoyed a delicious freshly cooked three course lunch with extras and went home tired but happy and full, taking with them a small Christmas gift. We are very grateful to so many this year not least those who donated, Roger Daltry turkey, Old Orchard Nursery gammon and cheese, Waterhouse funeral directors £100 for the wine and soft drinks, April Barrow Christmas puddings, Northiam Dairy cream and milk, Eileen Craddock Christmas crackers, Lorna and Yuti Chernerovsky wine and chocolates, Pat and Peter Stephenson Christmas cake, cash from Marjorie Axell, Martin Susse and Peter and Mollie Beachamp. This was just wonderful and we find it humbling so many want to give. Thank you so much. But this lovely lunch couldn’t take place without the wonderful volunteers who give up their day to help, and this year we had more than ever, which made it so much easier to put together and make happen, so huge thank you to Babs and Phil Dixon, Jilly and Andrew Wingfield and Jilly’s dad Edward, Bridget and Alan Shersby, Jacqui, Dave and Lucy Kuhler, Jackie and Michael Ashdown, Carol Whittam, Celestine Swatton, Natalie Crabtree and Linda Cooper. This is our thirteenth year of organising this lunch and the first time we have felt so relaxed at the end of it but also thanks to the generosity it hasn’t cost us. The feedback from the diners has been very pleasing too. Someone asked when I was going to stop doing this, all I can say is I am not ready to yet. Apologies: I am really sorry I missed last weeks edition. Illness got the better of me and had to succumb to my bed. I am sorry if you had an event that should have been covered. I hope that it went well and was well attended. BAZAAR: Last Friday, the Burwash PTFA held their annual Christmas Bazaar at the village primary school. They had an amazing array of stalls, thing to do, try, and buy. The event also had stalls and refreshments in St Bartholomew’s Church. They would like to say a big thank you to everyone who went along, helping them raise a fantastic £1,500. Well done everyone who helped to make this such a successful event. QUIET WEEKEND: After the busy couple of weeks that our three villages have had, having been very involved with commemoration of 100 years since the end of the WW1, this weekend is a quiet one. Time to reflect on the different services and commemorative events we have held, all the poppy making and hanging, and time to recharge our energy levels ready for the Christmas events planned. Some time over the weekend we hope to decorate the village hall in readiness for the Christmas bazaars etc but that is all that seems to be happening. Well done to all those involved in the commemorative events especially Sarah Walker for the exhibition in the church last weekend. It looked awesome. SOUP LUNCH: A big thank you to everyone who attended the soup lunch last week. It was the best one yet. With over 50 people sitting down to enjoy the seven varieties of freshly made soups and eight delicious puddings the atmosphere was terrific. Grateful thanks to those who helped especially Wendy Woolgar, Lorraine Tester, Trudi Lavender Russell and Jilly Wingfield who worked so hard with me in the kitchen. The result was a fantastic £455.08 for the fund for new windows for the front elevation at the village hall. JUMBLE: Wow, what a turn out for the Guides and Brownies jumble sale last Saturday. I don’t think I have seen so many people at one, it was like a sea of people entering the hall. They certainly had a wide and vast variety of items to rummage through as all the tables were piled really high with goods. The guiders are very grateful to all the parents that turned out to help man the stalls, but equally to everyone who came along. A total of £415 was raised for group funds. The best result ever. The guides and Brownies will now look to organising their Santa’s grotto for the festive evening, which is being held on Wednesday December 5. Also their Christmas card delivery. More details nearer the time. FIREWORKS: Congratulations to everyone who was involved with the Burwash Bonfire and Firework evening last Saturday. Despite the cold I was told that there was a good turn out. Not being a lover of fireworks, although I enjoy watching from afar, I didn’t attend myself and have spoken to some that did and they all agree it was a great evening. The fancy dress costumes were awesome and some quite scary. There was music and food to enjoy too. Watching the fireworks from the safety of my front door step I can tell you they were brilliant very colourful and amazing displays. Well done everyone on all your hard work fund raising and getting it altogether and then clearing up. One or two items were found after the event, if you have lost anything in the field let me know and I will put you in contact with the right person. SALE AND TEA: The Burwash Not So Young Club invite you all to join them at Burwash Village Hall tomorrow, Saturday, for their annual autumn sale and tea. Doors will open at 2.30pm until 4.30pm, entrance is £2 and includes a cream tea. There will also be stalls selling produce, books, bric-a-brac, jewellery, crafts etc and a raffle. All proceeds go to the club’s funds.